A few years ago I made a half-hearted attempt to read Micahel Pollan's The Omnivore's Dilemma. I say half-hearted because once you start throwing scientific jargon at me, I shut down. And that's exactly what happened. I didn't understand what I was reading, and therefore decided to abandon the book. I had seen and heard Michael Pollan on Oprah a few times and felt that I got the gist of his message from watching him on TV. And so this book is divided into those three categories mentioned above. In contrast to The Omnivore's Dilemma, the "rules" in this book are more cultural than scientific, but that is precisely what allows for them to be so accessible and memorable. Pollan likes to consider them more personal policies than actual rules, but if you want to call them rules, I think that's OK too. Despite the fact that there are 83 rules listed in this book, even if you can't remember them all (and let's face it, who would remember them all? ), there will likely be important ones that stick with you and become part of your personal food mantra. A rule like "Pay more, eat less" is something that everyone can remember. It's steeped in the same idea that I learned from watching Dr. Oz, which is: spend more money on food and less on health care. The more mindful we are about the food we buy to put into our bodies, the less time we will spend at the doctor. So if you think you can't afford healthy, good quality food, just look at your doctor bill to see if it agrees. "The healthiest food in the supermarket - the fresh produce - doesn't boast about its healthfulness, because the growers don't have the budget or the packaging. Don't take the silence of yams as a sign that they have nothing valuable to say about your health." Since the water you cook vegetables in is full of vitamins and minerals, save it for soups and sauces. Brilliant! Instead of asking yourself if you're full, you should be instead asking yourself if your hunger is gone. Those are two different questions with two different answers. As Pollan says, "When we ask children 'Are you full?' we're teaching them to eat more than they need to be satisfied." Why? Well, according to Pollan, you eat more leisurely and enjoy the food more if you're not being assaulted with commercial messages during your meal. This rule relates to the feeling of guilt we have when we waste food. Our parents always told us to clean our plates. But in reality, cleaning our plates often results in overeating. Composting also helps with our reluctance to buy fresh produce for fear of it going bad before we have a chance to eat it. If you can't feed it to yourself, feed it to your garden. Finally, in this new edition of Food Rules, Michael Pollan asked artist Maria Kalman to illustrate it. And as far the illustrations go, while I thought they were lovely, I didn't feel like they added much to the conversation of the book. If anything, they just helped break up the monotony and the colors helped you to stop and pause and reflect on that you just read. I would have like to see more illustrations on the page of the actual rule they were illustrating rather than after the fact. But then again maybe I've been reading too many picture books and that's just the way I like my illustrations to be. Either way, this book is a worthwhile read, illustrations or no. #29 is great -- I never thought to make carrot water the basis of a stock, but it makes good sense! Thanks for sharing these. I loved this edition -- I'm such a Maria Kalman fan. I agree that the rules or guidelines are so easy to follow. I think pairing Michael Pollan with Maria Kalman's illustrations is marketing genius! How did I miss this? 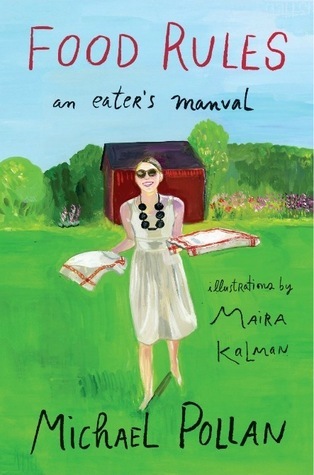 I adore Maira Kalman. Off to add it to my wishlist! Thank you so much. I think the rules you cited are good ones. Sometimes you just need to stop and think about things, like the super foods. I've never thought of it that way, but I can completely see the truth in that. It's more about advertising budgets than health benefits. You chose some good rules there, I like the spinach water and the silence of the yams cracked me up. I love rule #29, and silence of the yams...too funny! Sounds like more my speed too! I like my nonfiction books boiled down! Sounds like a lot of good common sense! I really enjoyed this one, too. Right now, I'm reading Cooked, Michael Pollan's latest book. There's some science in there, but most of it is stories. You might like it!